Unfortunately, they seem to be running now on Page One. 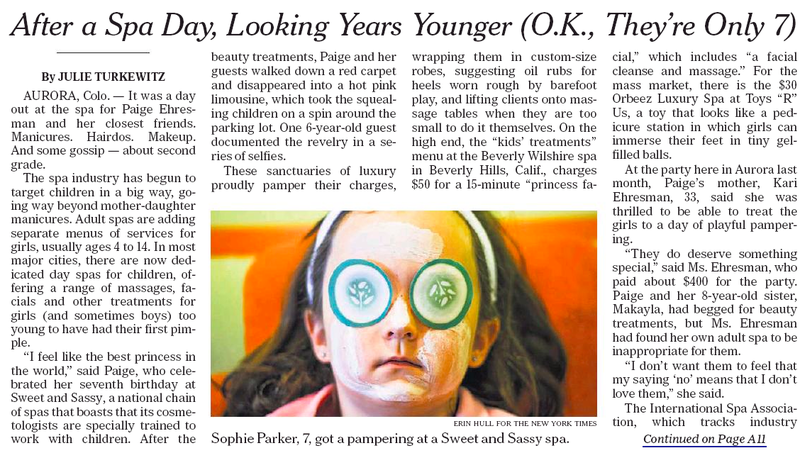 Welcome to the world of the $50 “princess facial” and the New York chain Seriously Spoiled Salon and Spa. This entry was posted in Uncategorized and tagged International Spa Association, Julie Turkewitz, Kari Ehresman, Lynne McNees, Makayla Ehresman, Margaret Sullivan, New York Times, Paige Ehresman, Public Editor, Seriously Spoiled Salon and Spa. Bookmark the permalink. The “front page” of the NY Times (I can’t believe they even have meetings to discuss what goes on that page, but they do!) has become a parody of itself, with idiotic wishful-thinking trend stories, miniatue stories “expanded” to the max, speculative articles, and very little actual solid reporting. Sometimes the line between the NYT and The Onion is very thin and hard to discern. DIfference is attitude: the NYT takes itself so seriously, with the “if we say it, then it is a) true and b) important”, regardless of reality. And way too many of their headlines are teasers: especially check out the headlines on the website–often, you can’t tell what’s the actual story theme, point, subject, or thrust; I suspect they assume you have time and inclination to check it out since, hey, it’s the NYT taunting you with a clever but obscure headline (there are no clarifying subheads on most web items, only the very top ones have those). A headline such as “On Long Island, a New Type of House” really doesn’t work on the web! They simply haven’t learned or won’t admit that on the web, a headline has to actually inform and explain, not just be clever and tease. I don’t think they will admit to the difference between print headlines and web ones-or maybe even know the difference. Yeah – something for everyone to hate in the Times, Bill. This article is the gift that keeps on giving. My folks would have sent me to a pizza parlor for a pepperoni facial.